Commercial Awnings & cover systems from Samson Awnings. 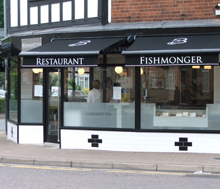 Samson Awnings specialise in commercial fixed and retractable terrace cover systems ranging from large commercial umbrellas right through to various all year round use outdoor room solutions, either attached to an existing building or free standing. 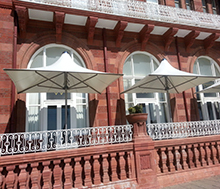 Whether you are looking for just shade from the sun or protection from the sun, wind and rain we have a system to suit, and most of our outdoor awnings and canopies are made to measure to ensure maximum protection and use in all seasons. We have terrace cover systems for free standing use, independent of any other building, or systems fitting directly to existing buildings, many are the same products but with some additional framework used when required as free standing. A lot will depend on the site layout and building shape and height, it is rare to have a flat, wide, level, and high brick wall at the front or back of many pubs, cafes, hotels, schools or restaurants so compromises and solutions have been devised and developed to cater for this over many years. All the cover systems only require minimal groundwork compared to a brick built extension and do not generally require any building regulations to be adhered to as they are not considered a permanent part and fabric of a building. This makes installation faster and planning permission usually easier to obtain when required. 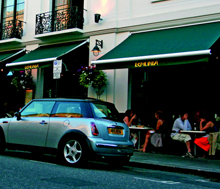 A retractable awning will cater for almost any premises, either at the front or back, but any self supporting retractable awning will have relatively low wind speed limits for use as it is only supported from the back, and as the size gets bigger the wind has a greater effect on the fabric when extended. 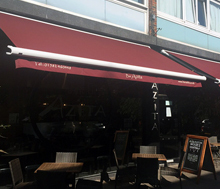 We can provide retractable awnings up to 15 metres wide and also 4 metres in projection but they do require a reasonable height at the back and preferably a steep pitch on the fabric cover to ensure fast and reliable rainwater clearance. Awning fabric covers can be branded when required and can provide a dramatic effect on any building and help to enforce your business brand and awareness. 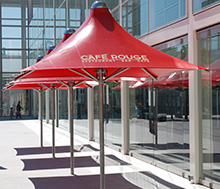 One of the most popular cover systems and solutions for sun shade but with a far higher wind rating than a normal retractable awning we offer the Vortex umbrella. This is a free standing solution of course and will rely on a very stable and correctly fixed support base for its stability. The Vortex is a unique commercial umbrella in that it has one of the highest wind ratings for any commercial umbrella in the UK – over 100Km/h to be exact!! It is available in 3 sizes – 2.8m and 4.2m square or a 4m x 3, rectangular shape. The main framework structure is constructed from high grade stainless steel sections and components. The fabric on the main cover is a super tough, fully waterproof fabric with a choice of colours and of course the ability to have logos and text to promote your business again. This is a truly unique umbrella and we would have trouble suggesting any other umbrella if you do want something that can be used most of the year round. 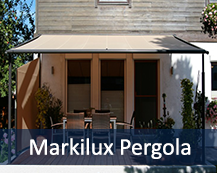 Markilux Pergolas are retractable fabric roof cover systems using the cassette principal of an awning to house the fabric inside, but unlike a normal awning this system has aluminium side guides and front post supports and does not use the folding arm principal of a normal awning, which restricts the projections possible. This system can be up to 6 metres in projection and up to 6 metres wide in one unit. The Pergola can also be coupled together to make systems as wide as required and also fixed back to back to form a gable roof shape with 2 x 6m projections providing 12 metres of retractable roof cover, by whatever width is required. The tensioned fabric cover is extended and retracted using an inbuilt electric tube motor driven system. Tensioned cables inside the side guides make the fabric cover as stable as possible with the fabric also supported sideways by being ‘zipped’ into the sides. With over 140 different and high quality fabrics to choose from and modern tough finished colours offered as standard for the framework with adjustable pitch, depending on the site requirements, this is a superb system for covering large areas on patio, terrace and garden areas. The Pergola can also be installed using the Markilux Syncra aluminium frame system to enable a freestanding solution. The Syncra is an aluminium framework finished to a high standard with different methods of fixing available enabling the use of most Markilux products when a wall mounting is not possible. 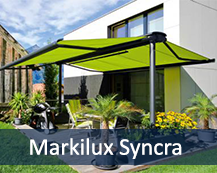 The Syncra is most used for the various Markilux retractable awnings fitted either side of the cross beam to form what is commonly known as a ‘butterfly awning’. Again large areas can be covered using this method as the Syncra units can be coupled and with 2 awnings capable of 4 metre extensions either side you can cover 8 metres one way and have endless width capability lengthways. The Markilux Syncra is the strongest butterfly awning system currently available in the UK and Samson sell many of these units a year. The fabric fully retracts into a stylish cassette. This provides for premium aesthetics and full protection from the elements. The cassette is offered in the 6 standard cassette colours and 162 custom RAL colours. 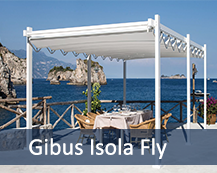 One of the best wall fixed or stand alone solutions for covering large areas and providing a waterproof fabric cover is the Isola Fly. This is an aluminium framework structure with a retractable fabric roof which directs rain water off 2 sides only in its design. The roof is electrically operated and controlled by remote. This system has proven to be very effective all round and is quite unique in its operation compared to other systems. 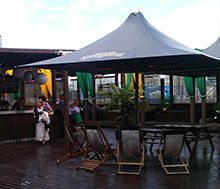 It is a very cost effective way of providing stylish, visually pleasing retractable cover for large outdoor areas. To enable use in higher winds and heavier rainfall then you have to close in the sides as well as the roof. For this to be possible then the basic structure has to be strong enough to enable additional elements and extra weight to be installed. Every all weather solution will have a static framework upon which various options of retractable roof systems and side elements will be fitted and integrated. The system also has to collect and disperse rainfall rather than let it find its own path. Integrated rainwater guttering is built into every all weather solution and then directed discreetly down support posts and away from the structure. Having a solid framework for any of these ‘outdoor rooms’ also enables the installation of integrated lighting, heating and other accessories to truly create a desirable outdoor space. These truly are the ultimate outdoor cover systems. The Pergotex is an adaptation of the hugely successful Glasoase glass room and Terrazza glass roof systems manufactured and sold by Weinor for many years now. 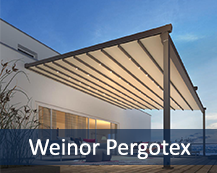 The Pergotex system uses the same aluminium framework structure and technology to create the main base structure. A fully retractable electric operated vinyl fabric roof is then integrated, along with rainwater guttering at the front profile to collect the water and channel down the front support posts. The Pergotex comes into its own when fitted with any of the optional elements offered for the front and sides. It can be fitted with solid materials, including glass panels, sliding or folding glass doors, vertical fabric blinds and other products designed to protect and control the inside from the weather changes. This is an all year round area where you can comfortably book customers or guests, and know that you will not have any problems whatever the weather ends up being. 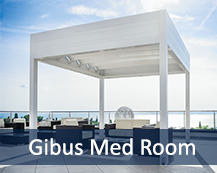 The Med Room is a further enhancement on the outdoor room concept in that the framework structure produces a level and flat roof whether it is wall fixed or stand alone. The integrated retractable roof is not level but hidden inside the framework system. The sloping roof is designed to direct rainwater into side channels to then flow away down some or all of the supporting legs of the structure. The sides are closed using any of the optional vertical blinds, clear or opaque, sliding glass doors or solid infills. This enables ultimate control, whatever the wind direction, rainfall and temperature outside happens to be at any time. Again, LED lighting, heating music speakers and other accessories can all be added to make the area as usable as possible and a truly desirable area to be inside, whatever the function. The Twist is a further adaptation of the Med room principle with much the same framework structure. The difference is the roof, it is a roof constructed from rotating aluminium louvre type sections which can be totally flat and sealed against each other or opened up to 90 degrees and beyond to provide outside natural light and air flow whilst also enabling control of sun shading. With a wide range of modern and traditional colour finishes this all weather outdoor room system can provide excellent additional space for any business. 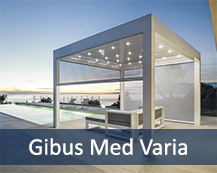 The Med Varia is a louvred roof system that has certain similarities to the Med Twist system, With the same twisting blade roof system, the Med Varia allows for full control over the climate. The frame is also designed from the ground up to be a more modular system, with the sides incorporating zip closures as standard, and is designed to be combined with glass doors, panels and more, to protect from sun, wind and rain. This makes the Med Varia one of the most versatile systems on the market today. These are new louvred roof cover systems by British company Milwood. 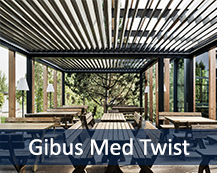 Their new Agava is a fantastic bioclimatic pergola, with blades that can rotate 120° in order to create a purely natural feeling airflow throughout the system. The frame is designed to a minimalist style, and looks incredibly modern and stylish. The system has internal guttering and is designed to be both a stand alone system or fixed to an existing wall or structure. 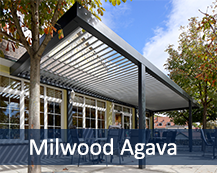 Multiple systems can also be combined, and with a range of three different designs and a host of aesthetic options available, the Pergola Agava is a truly adaptable system, capable of suiting and enhancing a host of different properties and businesses.